The engine in this vessel appears to be original likely installed in the early 1950's. It appears clean and without any noticeable areas of corrosion. There is no hour meter. The seller reports it to be in good condition and that it ran well before it was stored. Certainly a mechanical inspection would be recommended upon purchase. The sail compliment on the vessel consists of a main, a newer stays'l, jib, spinnaker, #1-2 +3 Fisherman plus a "golly wobbler". Seller reports sails are 70% good with a couple in excellent condition. The rigging needs to have added to it a forestay and jib as the bow sprit was added in the 1996-2003 restoration but the boat has not left dry storage since that time. Displacement is estimated at approximately 28 tons. Seller reports keel is 15,000 LBS cast iron with a design 20% ballast to displacement ratio. LOA with bowsprit is approximately 65 feet. Stanley Bishoprick Jr. and his son Stanley Bishoprick lll (later the founder of Legendary Yachts) built this vessel starting in 1946. Launched in 1956 it was built from L. Francis Herreshoff's design #85. Built from traditional mahogany plank-on-frame construction the seller reports Corten steel was used as framing instead of wood. In the late '90s and early 2000s a restoration and cabin re-configuration was done by the team at Legendary Yachts. The cabin top and decks were all replaced; several planks in the hull were also replaced. The tanks were moved and re-installed to accommodate an interior renovation. The cabin / house styling and much of the interior saloon was re-styled at that time. The vessel was never re-launched after this but maintained in dry storage. Entering the vessel from an aft cockpit you step down to the galley to port and a navigation station to starboard. The galley has both refrigeration and freezer, a double basin sink, plenty of counter space and a large diesel stove with oven. There is a pilot berth aft to the starboard side. Forward is the salon with surround seating to port and a settee to starboard. The companionway going forward is to the starboard side. First cabin on your port side is the master with a double berth. Forward of that same side is the first head with shower. Next cabin forward is entered in the center of the vessel. It is a bunk style room with two singles on each side. Ultimately forward is the second head again with a shower. Each cabin has a wide variety of storage lockers, hanging lockers and drawers. Virtually everything inside the boat appears as new construction. All mattresses and seating cushions have been wrapped and placed in storage. Throughout the boat the floors are teak and holly solid wood coupled with headliners that are open beam varnished surfaces. A large butterfly hatch compliments the salon as do the polished bronze opening port-lights throughout the boat. Corten steel frames create the bones of this lovely L. Francis Herreshoff Marco Polo 56. Over these steel frames traditional mahogany plank-on-frame construction techniques have rendered a strong, ocean going, family cruiser. This vessel, shortly after completion sailed her family on the 1957 Trans-Pacific race, then known as the "Honolulu Race". The family reports they came in dead last as the matriarch aboard refused to allow the "boys" to have the sails up at night! Since that time she has sailed the Northwest waters until in 1996 she was hauled for a major remodel and design change of the cabin, decks and interior, all performed by Legendary Yachts in Washougal, WA. Dry stored since that time the sellers report she needs some rigging, both standing and running, navigation electronics plus some hull work. The president of Legendary Yachts thought about $50,000 would put her in excellent sea-worthy condition again. This is clearly a capable world cruising vessel. 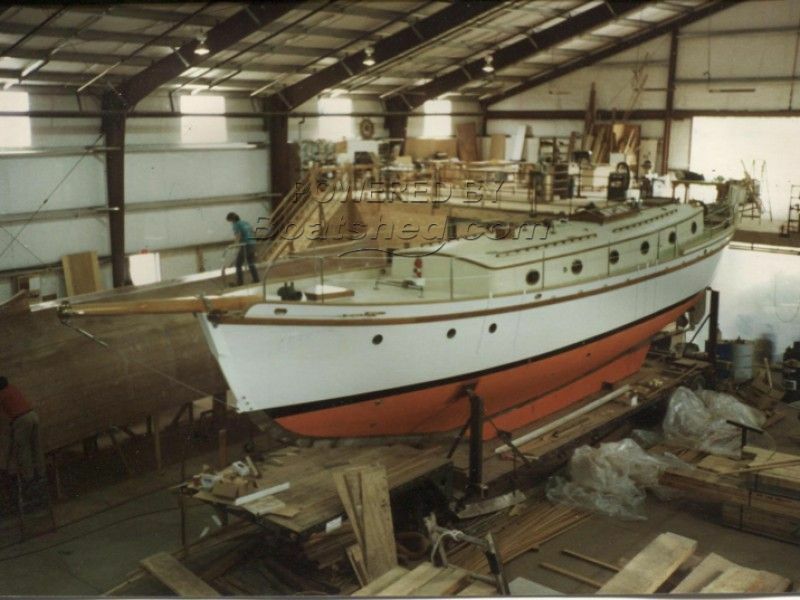 This Herreshoff Marco Polo 56 Schooner has been personally photographed and viewed by Gary Buck of Boatshed Tacoma. Click here for contact details.